I had a craftalicious Saturday at BFC because I saw Cheryl and Jean at the paper party in Hilo. They both had super projects to share and inspired me to keep thinking up new paper ideas. Cheryl's project for Halloween was a windowed Hello Kitty envelope for treats. She even supplied the chocolates! 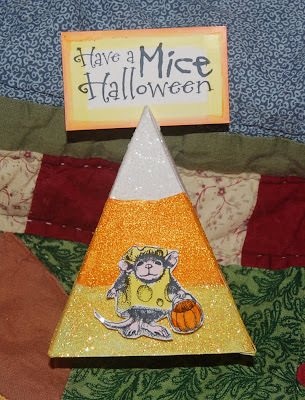 Jean (Dandelion Designs) made the cutest pumpkin card with a flip up lid that revealed one of her delightful characters. Thank you to both of these creative gals who brought their talents to Hilo. Saturday was also a good shopping day for me. I purchased lots of the new Hero Arts holiday stamp sets. Also Ben Franklin Crafts had Hero Arts felt snowflakes and poinsettias, which I think will be fun to add to my Christmas cards. 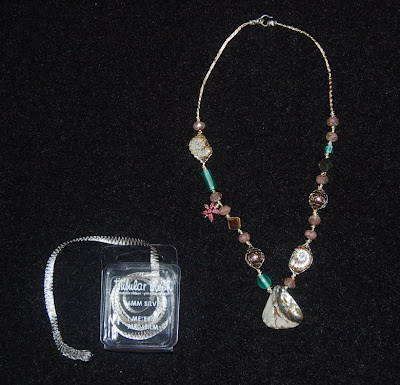 In the Bead Shoppe I discovered a clever new product, a magnetic heart locket and a locket bracelet. These lockets have are see-through and can be purchased with teeny tiny charms/letters, which fit in the lockets. The locket on the bracelet is fastened with lobster claw clasps. 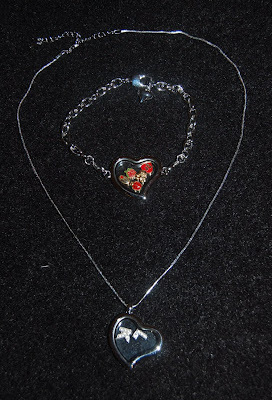 I filled my bracelet locket with all red charms ( for Valentine's Day) and the necklace locket has my intials. I plan to add some antique kimono fabric to the necklace for some color. These lockets are selling like hotcakes so you should check them out. They will make great gifts for a friend or yourself. Oh, and if you're in Kona, check out our new Ace Hardware/Crafts combo store. We hope you like it! I was rearranging my stack of Sizzix die cutters when I noticed that the triangle box one looked like a big candy corn.....too much Halloween on my mind I guess. Anyway, I cut out the box from glossy white paper. After folding the box, I colored it with markers hoping that it would look like the surface of a real candy corn. It looked okay but I decided to glamorize it with glitter and it looked much more festive. House Mouse clear stamps are from the Halloween set. I cut a slit on the top of the box to hold the stamped word rectangle. Of course, I think that this box should be filled with candy corn. It would make a good favor box/name place card if you wrote the guest's name on the rectangle card. I desperately want to get some of the Dandelion Designs Halloween stamps to decorate my other candy corn boxes. Jean, are you bringing some to Hilo with you to sell at the Ben Franklin Crafts store? I hope so. 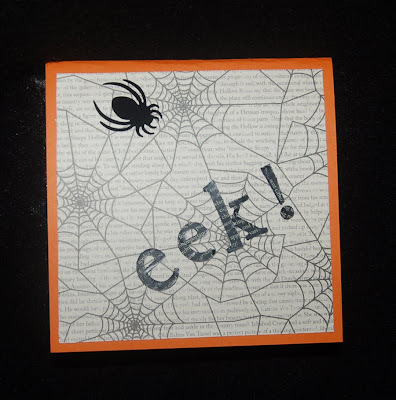 Some of you will think that I copied Cheryl's pop-up Halloween cards (seen on Joy of Crafting OC 16, Sunday 6:30pm) when you see this card, but honestly I had constructed it before watching the Joy of Crafting yesterday. I guess Cheryl and I are just thinking along the same lines. 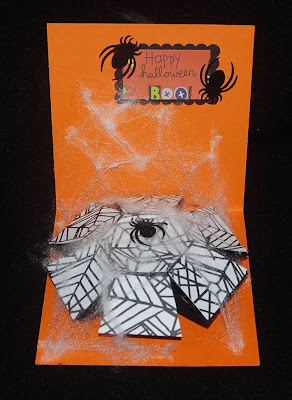 I used the ball pop-up Sizzix die cutter to make the spider web. I found that the ball shape was too round for what I wanted so I removed one rubber band to make the ball flatter. I made the ball from black cardstock and pasted on pieces I cut out from a 12x12 spider web cardstock by Imaginisce. (Save the die cut scraps to use as templates to mark the pieces to cut and glue to the top of the ball.) I was amazed that Cheryl also had the same idea to use the polyester fiber for the faux web. For the front of the card I used paper and sticker letters from Making Memories (last year's Halloween pack). The spiders are flocked stickers from Martha Stewart. I glued the web down with FabriTac and taped the paper parts together with Merikan double stick tape. 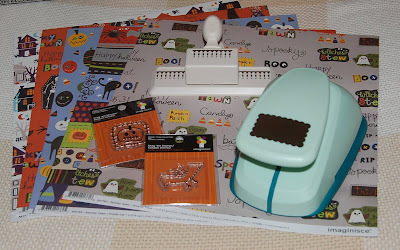 Thinking of different ways to use Sizzix dies is creative fun for me and I feel that I am getting my money's worth when I can use a die in several ways. Have a creative day! I keep thinking about my childhood summer days spent at the beach. Whenever September rolls around and school starts I still have the melancholy feeling of wanting to hang on to the salty sea taste, briney ocean smell, and the feel of sand between my toes. Even as a child I was a collector of shells, rocks, driftwood, and other treasures washed ashore by the ocean. My days as a student are long gone, but I still find inspiration for my jewelry from my summer beach memories. I remember wearing puka shells around my neck for years (that dates me doesn't it? ), so when I found the square puka shells at Ben Franklin Crafts Bead Shoppe; I knew that I had to use them in one of my creations. 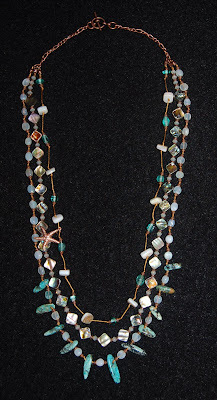 The necklace in the photo also has small blue opal pebbles, abalone shell beads, African turquoise daggers, blue frosted glass beads, and Swarovski sand opal bi-cone crystals, all strung on thin nylon cord. Some of the beads are separated by knots and copper beads/caps. To add a bit of asymetry, I added on a single copper starfish. Right now BFC has a good selection of glass, shell, and gemstone beads that you can use to make your own beachcomber's jewelry. Making ocean inspired jewelry for someone far away from their island home is a very thoughtful gift of aloha. Whoa! It can't be Halloween already, but I recently bought some great 12x12 Imaginesce papers with spooky, wacky designs at Ben Franklin Crafts. Besides the papers, there are matching embellishments and clear stamps (only $1.49). (See photo.) I made some quick cards to show you how attractive the new line is. ( Click on the photo to enlarge it.) I also used two fabulous paper punches I just bought, the Martha Stewart picket fence and the giga Marvy scallop rectangle. The ribbons are from my stash as were the Dress It Up candy corn. I put pop-dots behind the fence and circles to make them stand out. Oh, the brown bat has FunFlock fur and red Smooch metallic paint eyes and lips. The blue bat has different-sized, red rhinestone eyes. 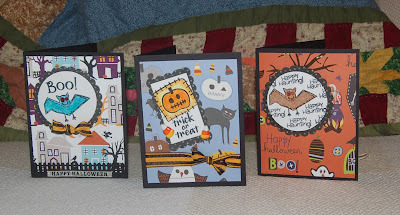 I love these Halloween papers (and the ones from American Crafts) so I will be working on some treat boxes that will show off the double-sided feature of the paper. The fall and Christmas decorations are starting to fill the store too. I told myself "no more ribbons" but I know that I'll break down and get some of the extra wide sparkly ones and I probably won't be able to resist the autumnal colored ribbons either. I purchased some of the plain cookie/candy cardstock boxes which can be decorated and used for any holiday/thank you gift. There are lots of bead specials in Ben Franklin Crafts right now so it's the perfect time to start crafting your holiday jewelry gifts. Okay, it's shopping time! Sometime ago I purchased a product called. Tubular Mesh by Beadsmith. I saw some pretty jewelry made with it and I was intrigued, but I put it aside and got involved with other craft projects. Well, Imagine It focal shell pendants, Swarovski glass pearls, and new shell/gemstone bead stands provided the inspiration I needed to design a project with the tubular mesh. The tubular mesh is rather like the tube netting used to make candy leis, except that it is smaller and made of metal. These properties allow the tubular mesh to pass through the holes of beads as well as encase small-holed beads (like pearls). When you choose your beads for this project be sure that the holes of your beads (the ones you plan to string) are fairly large or you will have to do some drilling. When the mesh is collapsed it becomes a cord which can be finished off with a hook and eye crimp clasp (one with a large hole). Because I live on a tropical island, it seems natural that the jewelry I design often has an ocean theme. I like the fact that tubular mesh gives a look of a miniature fish net around the beads. The tubular mesh is fun to work with because it can be filled with small objects found while beachcombing to make a memory necklace. I hope that you will try this product to make some interesting jewelry for yourself or for gifts. 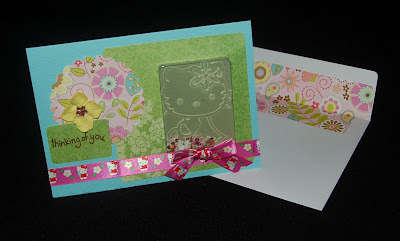 I was just about to throw away the packaging that the Hello Kitty Sizzix embossing folders came in, when it occured to me that I could use the plastic bubble windows to make shaker cards. Since I had tested the embossing folders on some scrap vellum, I decided to use a yellow piece behind the plastic window. Before sealing the edges with Merikan tape, I added some punched out flowers (using Martha Stewart's 3 piece hydrangeas punch). The green cardstock came from the DCWV Garden Party stack and the pink flowered scalloped piece was punched from Doodlebug paper. The ribbon is a Sanrio design from an Offray roll. Besides being happy to recycle the packaging, I am pleased with the way the vellum allows the light to show through the card, sort of like a stained glass window. For an extra handmade touch I lined the envelope with matching paper. (To see an enlargement, click on the photo.) Thank you for visiting this site and I hope that you learned another recycling idea. Ever since the movie, Slum Dog Millionaire, became a big hit; fashion and music have become influenced by the culture of India. When I first saw the glass, clay, and plastic 'Beyond Beautiful' beads from Cousins Corp., I immediately thought of making 'Bollywood' (the name given to this new trend) jewelry. Combining the beads with the Beadalon silver plated links gave the jewelry lots of 'bling bling' and movement. I especially love the beads with small mirrors embeded in them. 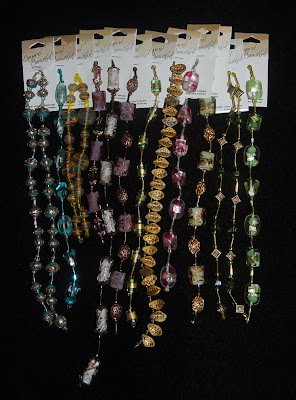 As much as I love semi-precious gemstone beads, this new line of beads at Ben Franklin Crafts is really appealing and inexpensive. 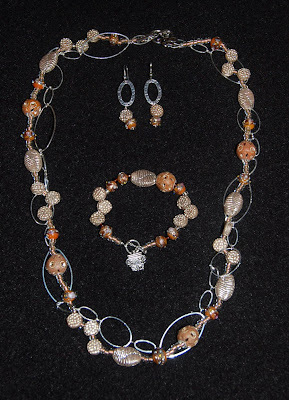 The directions for making this jewelry set will appear on our craft club website, http://www.bfcraftclub.com/ .